This GG Gamer 12 In Pro Taper Baseball Glove from Rawlings features the PRO H Web pattern, which was designed so that outfielders could see through the web to make catches and shield their eyes from the sun or lights at the same time. 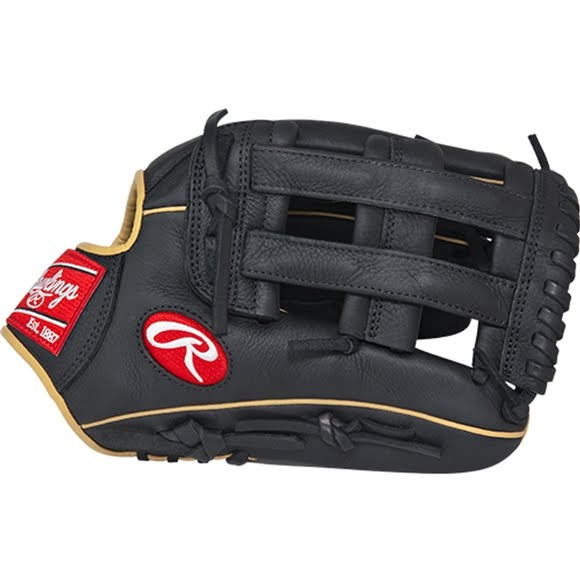 With its 12" pattern and deep pocket, this pattern makes it a great glove for youth outfielders. This GG Gamer 12 In Pro Taper Baseball Glove from Rawlings features the PRO H Web pattern, which was designed so that outfielders could see through the web to make catches and shield their eyes from the sun or lights at the same time. With its 12" pattern and deep pocket, this pattern makes it a great glove for youth outfielders. This glove was designed for the elite youth player that demands pro performance but prefers a more snug fit and lowered finger stalls to have more control. This GG Gamer Series glove utilizes pro quality materials and designs including authentic Rawlings Pro Patterns and high-quality US made Pro Grade Laces. With new pro soft leather that allows for a quicker, easier break-in, and full grain finger linings, these gloves maximize comfort and durability. Pro H™ is an extremely versatile web for infielders and outfielders.